30-page Japan Monitor document. Single user license. 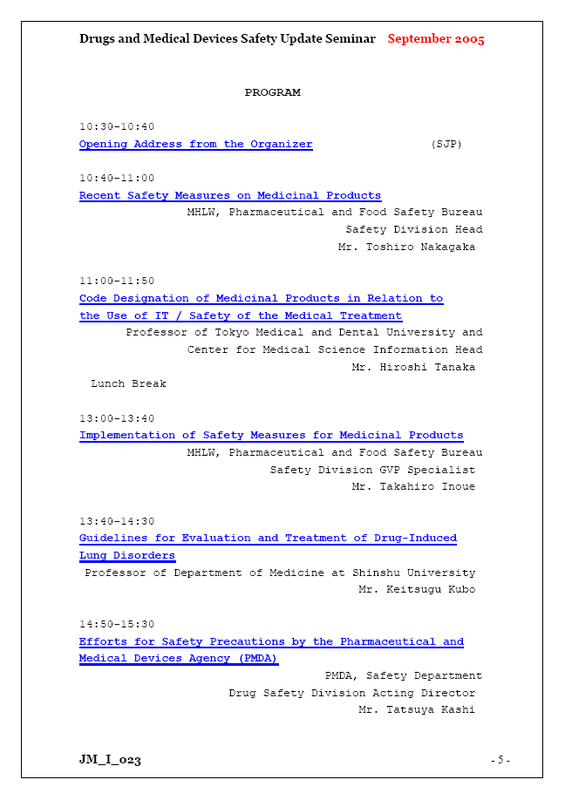 Every year the regulatory and pharmaceutical authorities in Japan are organizing periodic meetings on topics such as various issues related to the safety (under the title "Drugs and Medical Devices Safety Update Seminar"), new drug approvals, ICH, and QA of the pharmaceuticals and medical devices. The report on "Drugs and Medical Devices Safety Update Seminar" held in Tokyo on September 16, 2005 is compiled and published by Jouhou Koukai Publishing. For the first time in English the program and the key announcements, formatted, indexed, annotated and hyperlinked. Jouhou Koukai Publishing is a Jouhou Koukai business: pharmaceuticals, medical devices, drug approval, regulations, clinical trials, Japan pharmaceutical affairs, and global and Japanese regulatory affairs. Retrieval and consulting on drug approval and technical documents disclosed in Japan. (ISSN 1550-3429) Copyright © JKS LLC 2005.